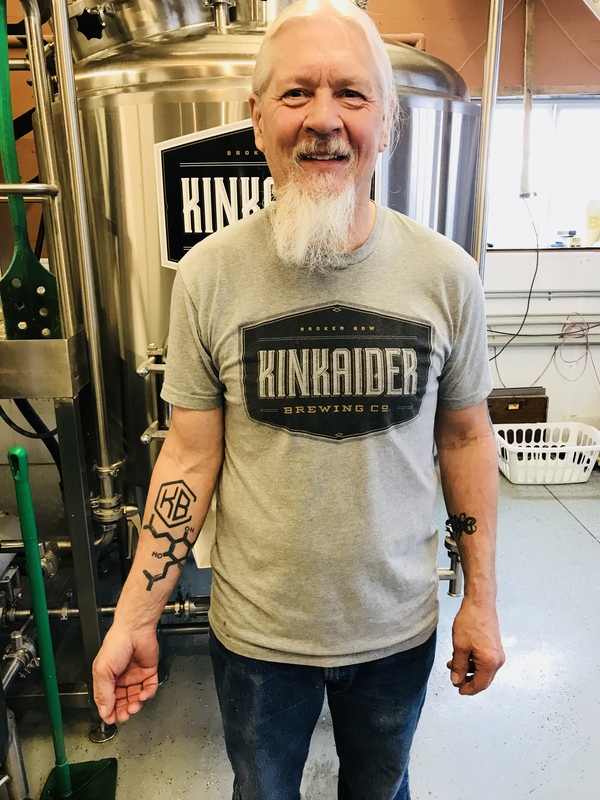 Central Nebraska’s Kinkaider Brewing Company is quickly becoming one of the most popular destination craft breweries in the Midwest. Located at the edge of the rolling Sandhills in Broken Bow, Nebraska, Kinkaider was founded by four small-town Nebraskans, three of whom we had a the pleasure of meeting recently. We visited Kinkaider on an agribusiness progressive meal tour during the Plains Safaris Conference and quickly found there are lots of things to love about this brewery. Here are just 10 of the things we love most. The name Kinkaider comes from a 1904 amendment to the Homestead Act. Moses Kinkaid was a member of the United States House of Representatives from Nebraska and sponsor of the Kincaid Act, which allowed homesteaders to claim up to 640 acres of government land in western Nebraska. 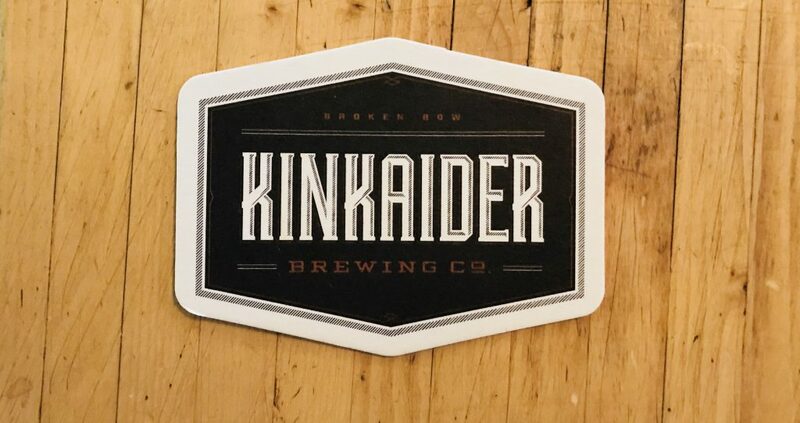 Kinkaider Brewing Company in Broken Bow, Nebraska, got its name from the Kinkaider Act of 1904. Kinkaiders were those who stood in line to claim government land in Nebraska. 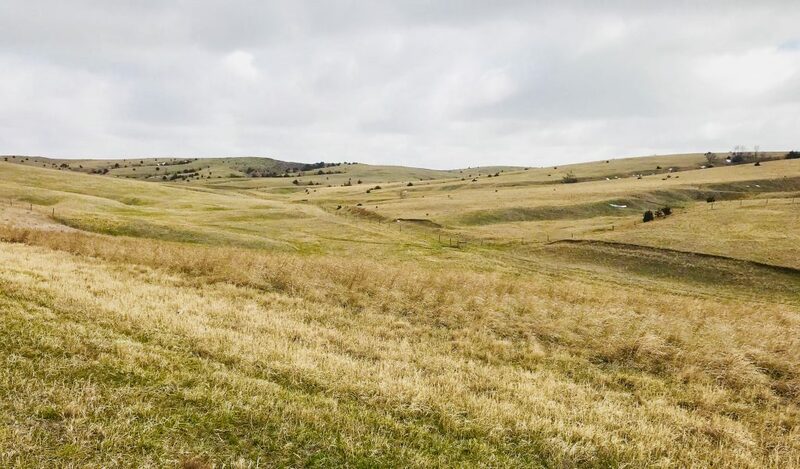 Homesteaders who gathered in Broken Bow to claim property in the 37 counties in the general area of the Nebraska Sandhills were called Kincaiders. We love that touch of local history. 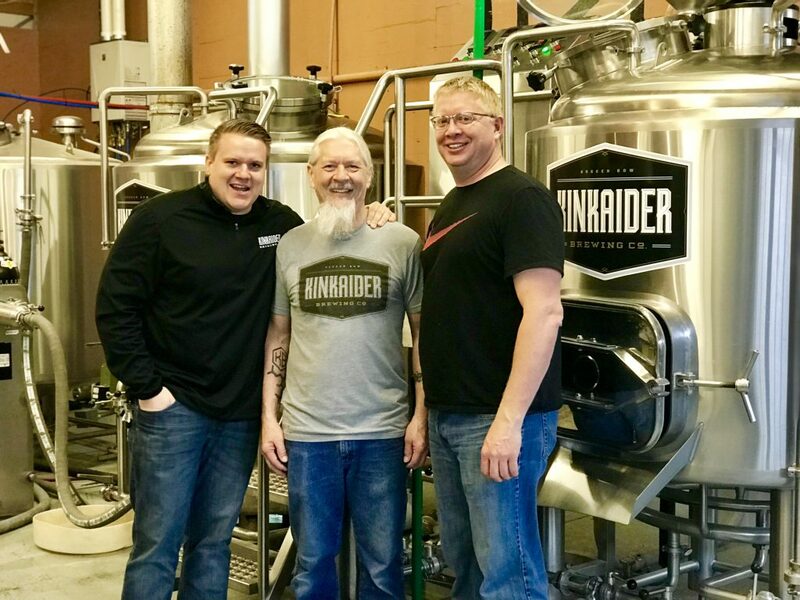 Former Thedford, Nebraska business owner Dan Hodges had just retired and purchased a new Harley Davidson motorcycle when local grocery store owner Cody Schmick approached him about a partnership to build a brewery. The original Kinkaider brewmaster is still crafting beers there and his wife, Alice, is also involved in the business. He is so passionate about his second career, he even had the company logo and the chemical composition of hops tattooed on his forearm. On our tour of the brewery, Cody reminded us that water is the main ingredient in beer. The Sandhills of Nebraska filter water naturally for the Ogallala Aquifer, the source of Kinkaider Brewing’s water. Since the brewery sits right on the Ogallala aquifer, it made sense to drill a well and use this incredible water source that is naturally filtered by sand, silt, clay and gravel. You can taste the difference. 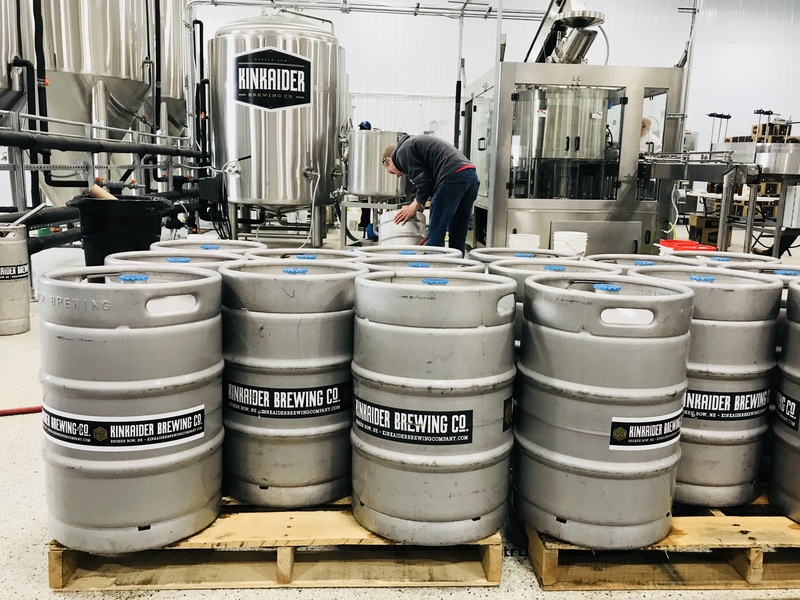 With rotating brews on 320 taps across Nebraska, Kinkaider beer is quickly becoming an area favorite and we know why. Apparently, any man willing to tattoo hops on his arm knows how to make good beer. Dan the Wiser, as he is sometimes called, and the other brewers have created more than 40 flavorful beers. The most popular seller is the Devil’s Gap Jalapeño Ale about which celebrity chef Michael Symon said, “With a hamburger, this is about as perfect of a beer as I can think of,” and went on to say it is a “good after you’ve finished mowing your lawn beer.” Frame the Butcher IPA and the seasonal brews are also favorites. Each of the beers has a name with a unique story behind it. Having come from the grocery business, Schmick said he knew that signage had to tell the story behind each name. 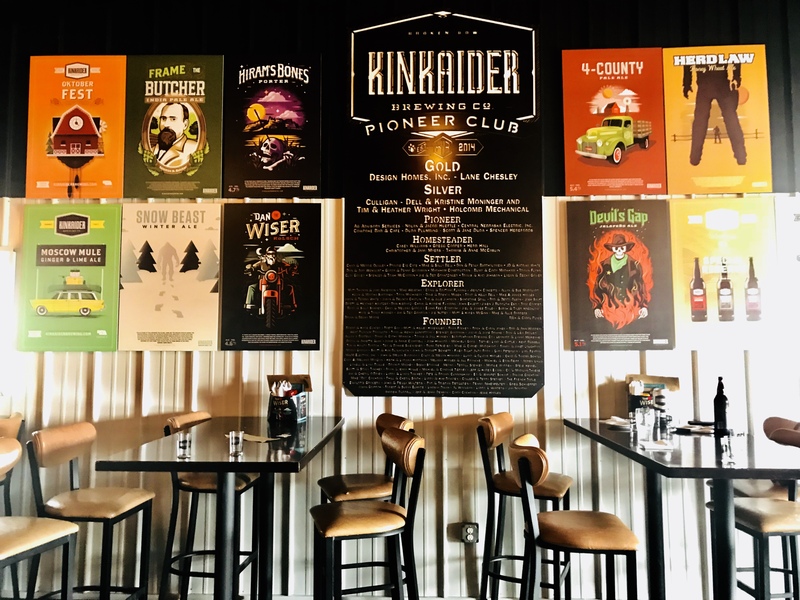 The taproom at Kinkaider shows recognizes their “Pioneer Club” who helped start the business along with the different types of beer they offer. 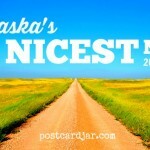 So far, all of the label designs have been created by Nebraska artists. 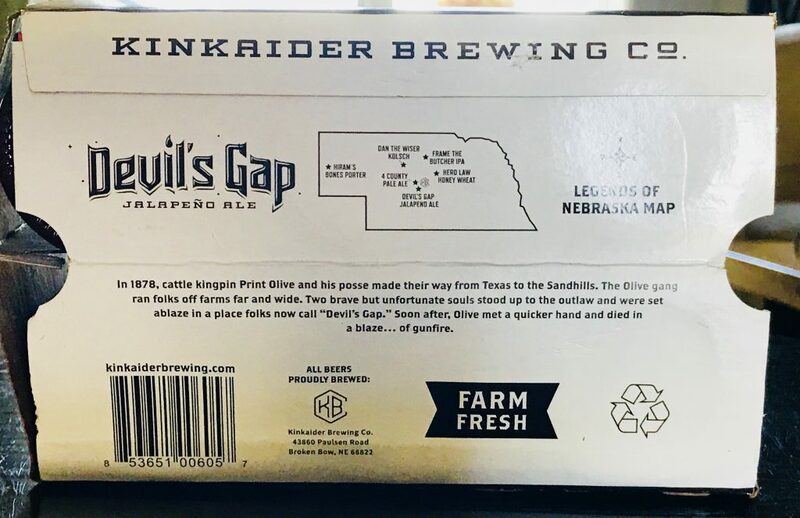 Devil’s Gap six-pack bottom from Kinkaider Brewing Co. in Broken Bow, Nebraska. The stories behind the beers’ names are included on the bottom of the six-pack packaging. One of my favorites, Frame the Butcher IPA, was named after Solomon Butcher. Butcher failed as a farmer, salesman, teacher and postmaster before taking pictures of more than 1,000 sod houses across Nebraska. He is now known as the photographer of the plains and in Custer County, a framed Butcher is never more than a stone’s throw away. 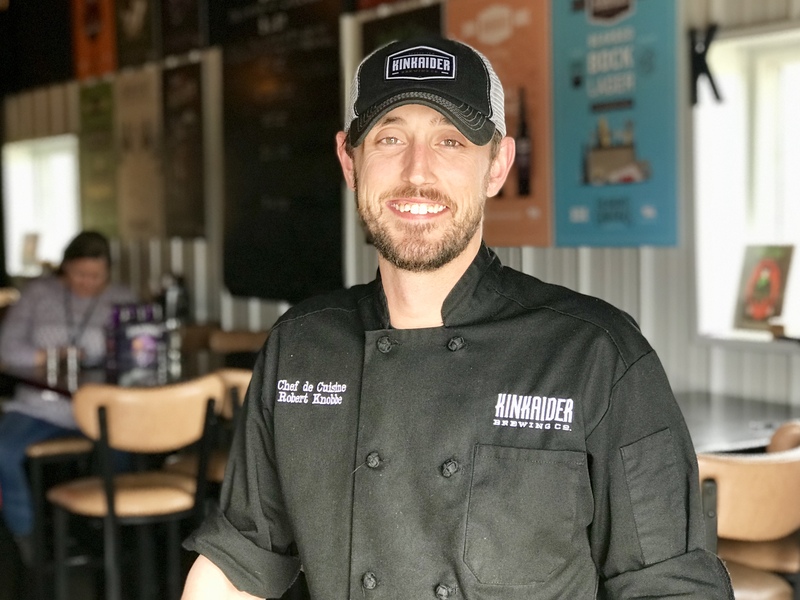 Chef Robert Knobbe has only been on the job a few months, but his delectable small plates and entrees are already giving the Broken Bow location a boost. 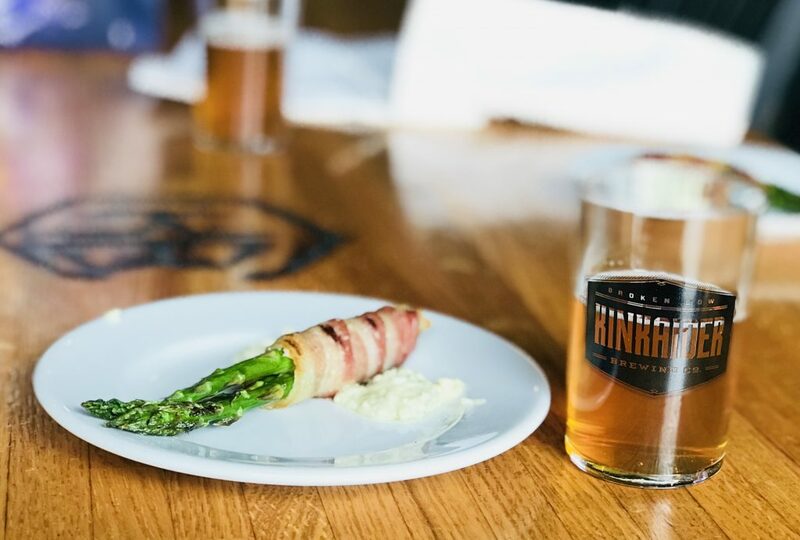 Bacon wrapped asparagus with a beer sample. Schmick said finding the right chef in the middle of rural Nebraska was not easy. He had all but exhausted his online search for a new chef last fall when he got a message from Knobbe. 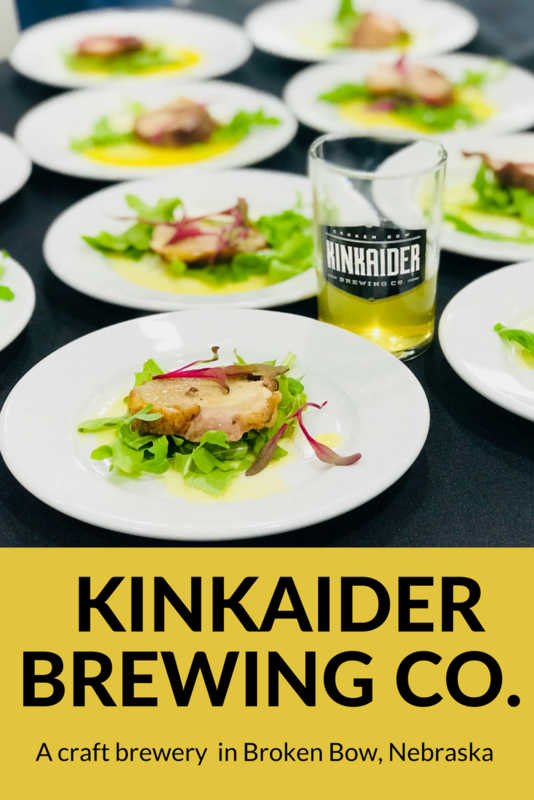 Chef Robert Knobbe of Kinkaider Brewing made some amazing appetizers for us to enjoy. Schmick said he invited Knobbe to Broken Bow for an in-person interview and they talked for three hours at their first meeting. Knobbe was hired on the spot. A West Point, Nebraska, native and self-taught chef, Knobbe learned to cook in kitchens in Nebraska and South Dakota and said he ordered cooking text books online to learn his trade. 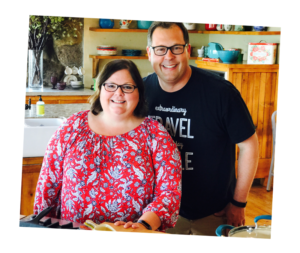 His hard work has paid off, as his food is some of the best we’ve tasted anywhere in Nebraska. Each of the four beers we tasted on our tour was well paired with small plates, created by Chef Robert. Champion, a crisp summer beer, was well paired with Chef Robert’s colossal shrimp and jalapeno mango chutney with puréed beet. It was incredible. As was the bacon wrapped asparagus and blue cheese appetizer, and the coffee crusted sirloin tips. 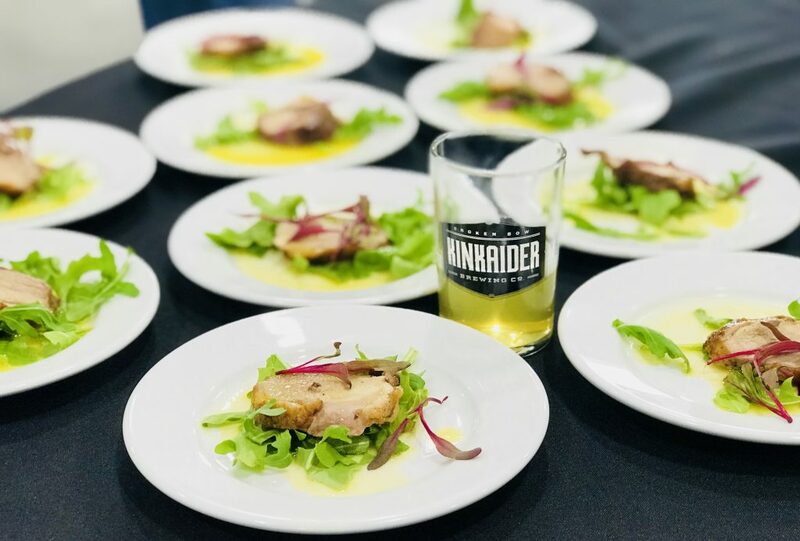 A sample of Kinkaider beer sits among plates of the delicious duck breast appetizer we enjoyed during our tasting. And the roasted duck with a citrus sauce and arugula – just divine. Just on the outskirts of town, the brewery is situated at the edge of the Nebraska Sandhills near Broken Bow (pop. 3,500). It is several hours away from the hustle and bustle of the state’s major cities to the east. And we like that. 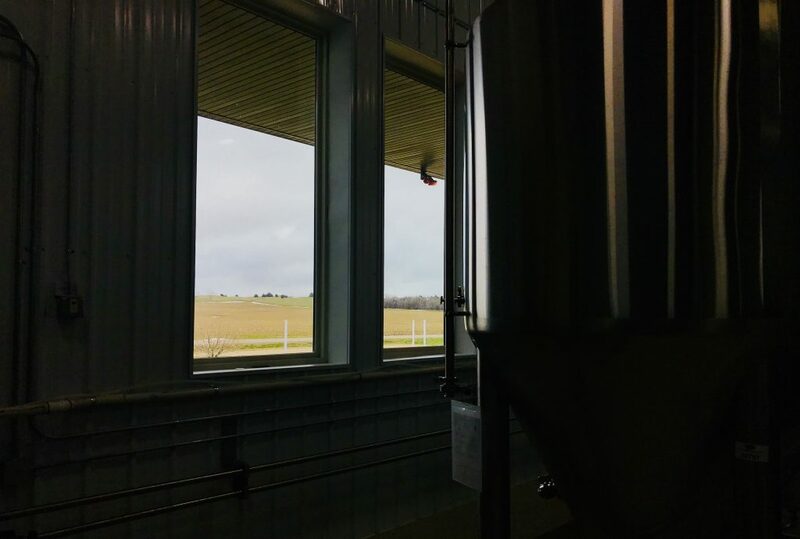 The view of the rolling hills from inside the brewery is just amazing. Before it was a brewery, the main building was a garage. With the help of locals who pitched in financially to fund the startup, it is now a well-renovated establishment that is as inviting to local farmers and ranchers as it is to bikers and travelers just passing through. 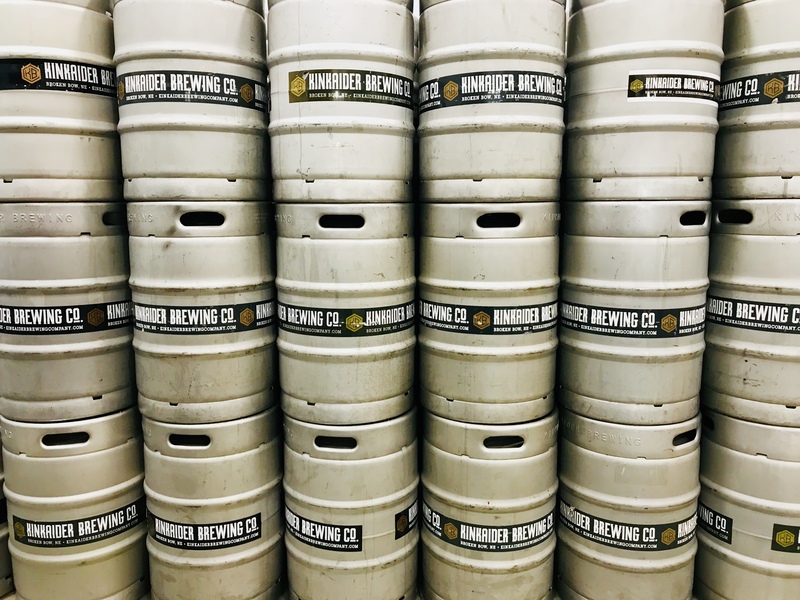 Kegs wait to be cleaned and filled at Kinkaider Brewing. There are outdoor spaces to eat and drink or listen to one of the live bands the brewery hosts during warm months. Even during the cold Nebraska winters, the rolling hills provide an incredible backdrop for unwinding and making memories with old and new friends. We met three of the four owners the day we were there (the exception being Nate Bell). And while there are lots of things to love about Kinkaider Brewing Co., what we enjoyed most were the people. Barry Fox’s desire to build a destination brewery. Cody Schmick’s passion for growing a small-town business in his home state. And Dan Hodges’ pride in his craft. We loved the entrepreneurial spirits of four Nebraska boys who had a vision of a place where they could work hard, serve others, make and share good no, great beer. As proud Nebraskans ourselves, we’ll always drink to that. Kinkaider Brewing Co. also has a tap room in Grand Island, Nebraska, and will open one in the Haymarket in Lincoln soon. Have you tried Kinkaider beer? Let us know your favorite – we’d love to hear from you.